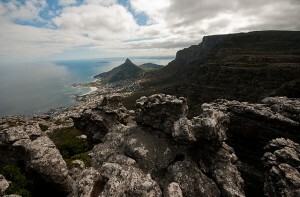 Table Mountain was recently voted as one of the new 7 Natural Wonders of the World. 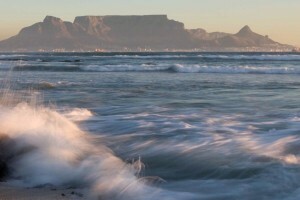 Table Mountain is a South African icon and the only natural site on the planet to have a constellation of stars named after it – Mensa, meaning “the table.” The flat-topped mountain has withstood six million years of erosion and hosts the richest, yet smallest floral kingdom on earth with over 1,470 floral species. Table Mountain boasts numerous rare and endangered species. 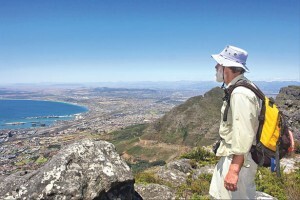 It is the most recognized site in Cape Town, the gateway to Africa, owing to its unique flat-topped peaks which reach 1,086 m above sea level. The Table Mountain chain traverses the entire length of the Cape Point Route so there are quite literally hundreds of hikes of varying length and difficulty. 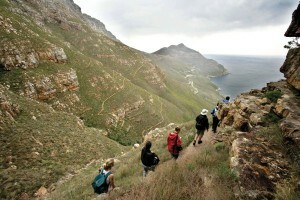 It is little wonder that hiking is one of the most popular activities in the region on this natural wonder! The smell of fynbos on a hot summer’s day, the reward of spectacular views from the peaks and ridges is something that is difficult to quantify and for me is a holiday activity bar none! (and its great to go for a lovely lunch or cold beverage after your hike too). 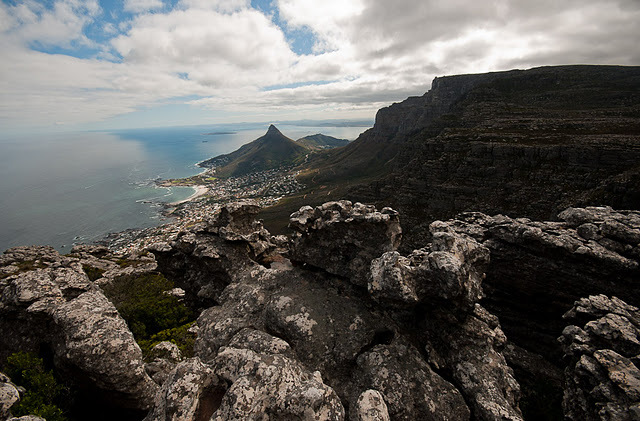 With two coastlines sweeping the edges of Table Mountain National Park, the Cape Point Route is a hiker’s paradise with adventure at every turn. 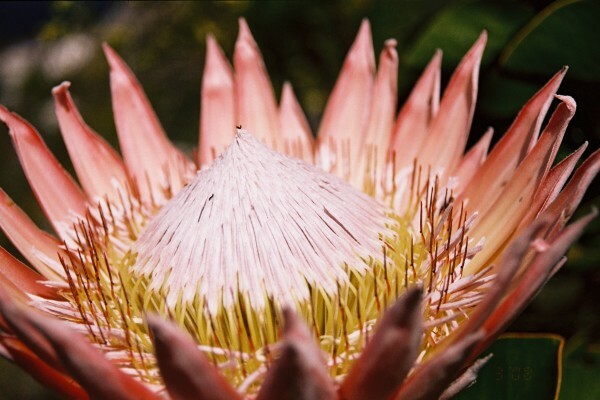 The range of trails takes you through a botanical treasure trove of unspoilt views. Set out on coastal walks, beach strolls, wetland wanderings, boulder scrambles, river rambles, bumpy mountains, lofty peaks and even steep cliffside ascents. You’re sure to get maximum returns for minimum effort – even on one of the short hikes. Hiking can be done alone but the mountain can be deceivingly dangerous so unless you have a good map (that you know how to read!) 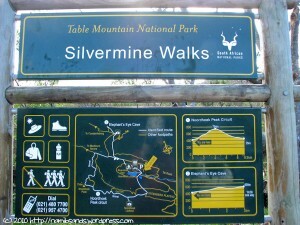 or are familiar with the mountains, it is advisable to go with a hiking guide. For a truly spectacular experience though is to do a 2 day hike with an overnight stay in one of the Table Mountain National Parks Hoerikwaggo trail tented camps. Regardless of which route you choose, be sure to hike safely. Take enough water with you, remember your sunscreen and pack your rain gear as Cape Town is known to have four seasons in one day. And of course, follow the age-old hiking tradition – take nothing but photos, leave nothing but footprints. 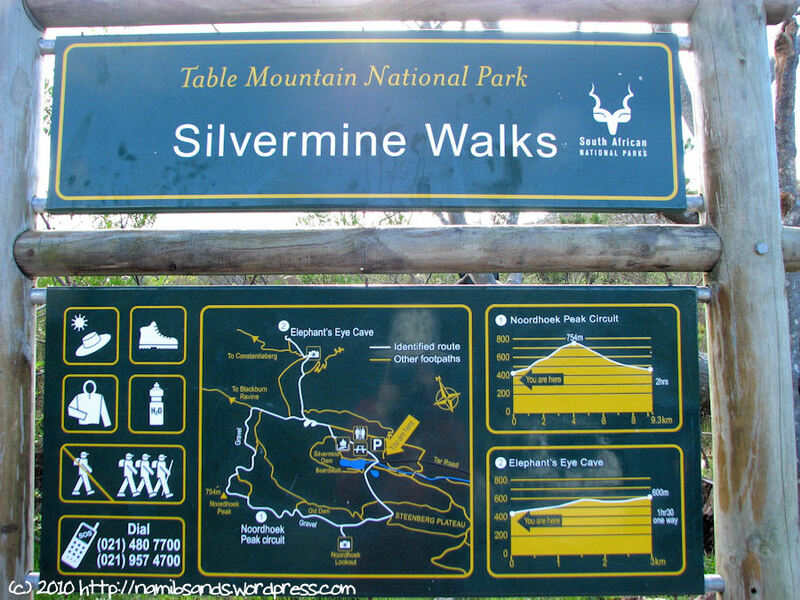 Silvermine Nature Reserve has great views and a range of hikes across a fascinating landscape of rock formations and fynbos. Silvermine is almost in the centre of the Cape Point Route and boasts numerous endemics and unique fynbos. Black eagles nest on the cliffs nearby and can often be seen gliding across the sky. Numerous well demarcated paths crisscross this terrain making it one of the easiest places to roam. 1. Constantiaberg Hiking Trail (+/-4-5 Hours): a circular trail from the reservoir up one side, and down the other side of the massive Constantiaberg. 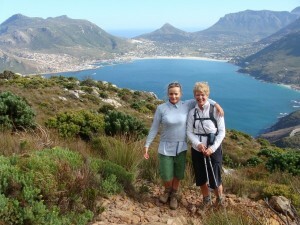 Lots of panoramic views into Hout Bay. 3. 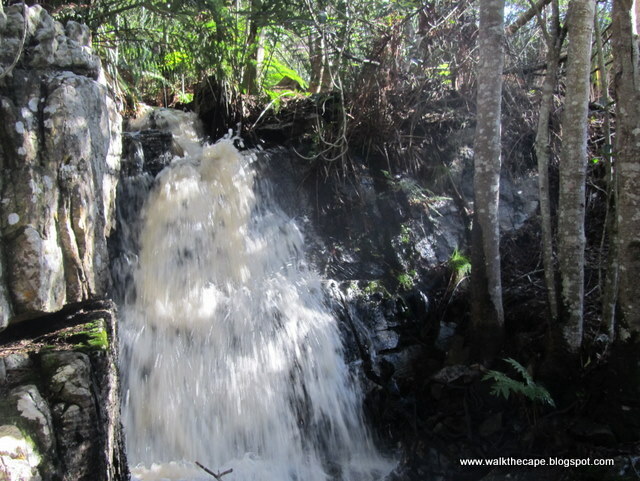 Silvermine Waterfall (+/- 4 hours): the waterfall is a spectacular hike especially in winter and is family and dog friendly! The most popular waterfall hike is a circular hike along a jeep track, over the head of the Silvermine waterfall and up on to the Steenberg Plateau, before heading back down to the car via Wolfkop or the skyline traverse. This walk is much easier than it looks. Park on the last big bend (on the Hout Bay side) before reaching the viewpoint at the top of Chapman’s Peak Drive. Head up the log steps by the picnic area and follow the stream until a fork. Take the right fork which heads up the ravine to the plateau. 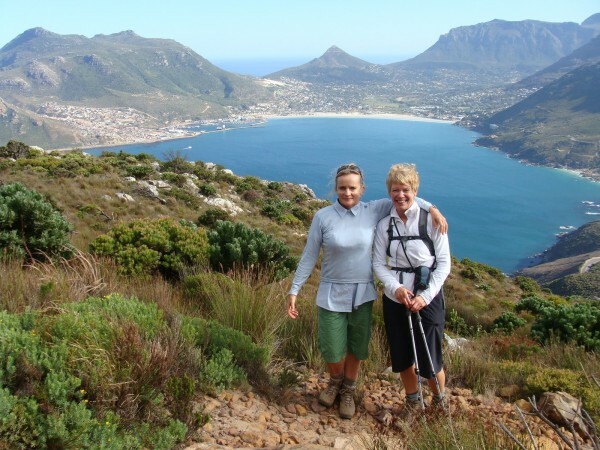 Keep to the right and head up the peak through dense protea bushes, cross the saddle and make the final assault to the peak for views of False Bay as well as the Hout Bay views. 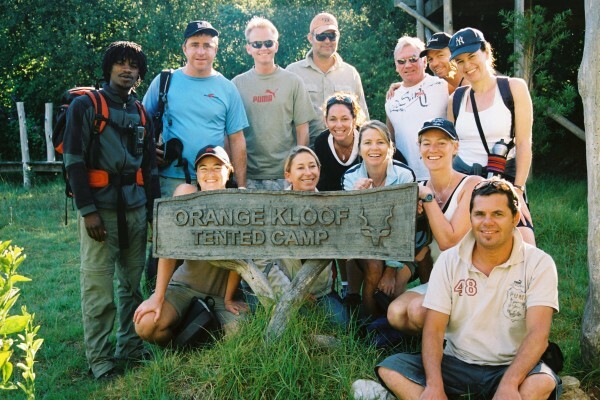 This is a relatively easy and relaxed trail through 2 indigenous Afromontane forests and visits the Kalk Bay Caves (there are actually 67 caves!). The hike starts from Boyes Drive and we suggest heading up Echo Valley so keep to the left path heading straight up (on the way up you will see paths on the left which lead to Boomslang Cave on Cave Peak, but head on up through the forest and shortly after emerging bear right to the Amphitheatre which is a perfect rest stop (it’s like a box canyon!) Head out in thefar left corner from where you came in. 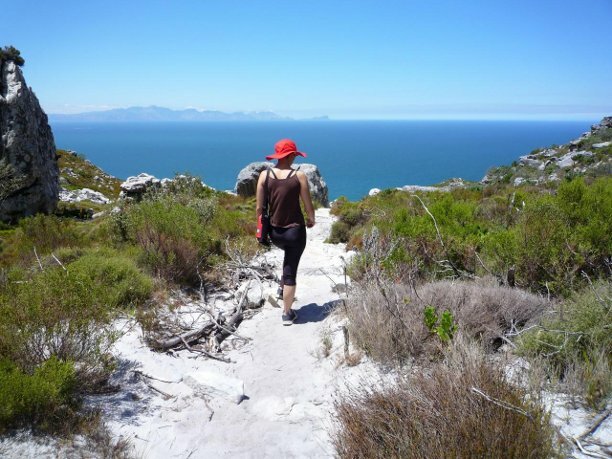 Look out for a few other caves at the top of the ridge – take the right fork and head to the trig beacon at the top of Kalk Bay Mountain before descending down Spes Bona Valley which is mostly a yellowwood forest. You come out at Ou Kraal and can head down to Boyes Drive. 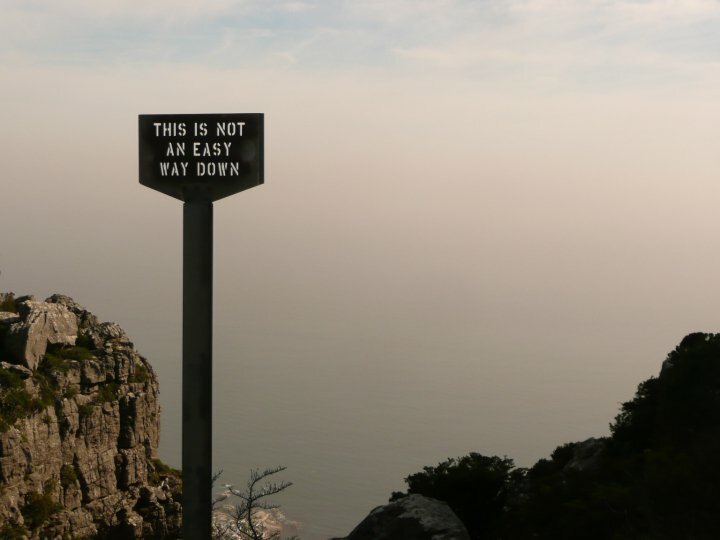 The Cape of Good Hope Section of the Table Mountain National Park is not as flat as it appears when driving to the viewpoint and lighthouse. 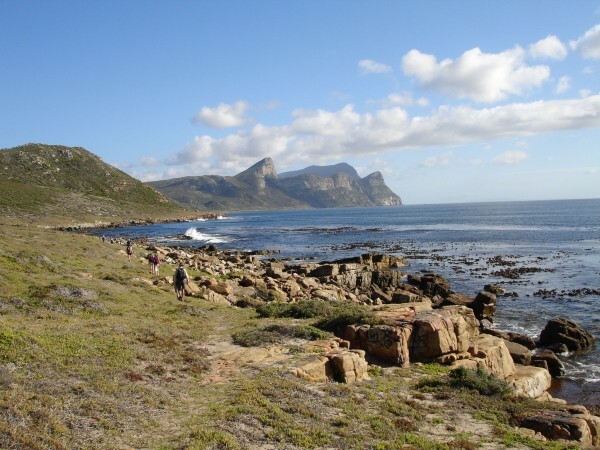 The Atlantic Coastline has open plains but the False Bay Side is undulating with steep and dramatic drops down to the coast making for more challenging hiking! There are numerous trails in the park from the 2 lighthouses trail – which is a very easy hike to the tip of the peninsula and takes about 1 ½ hours. 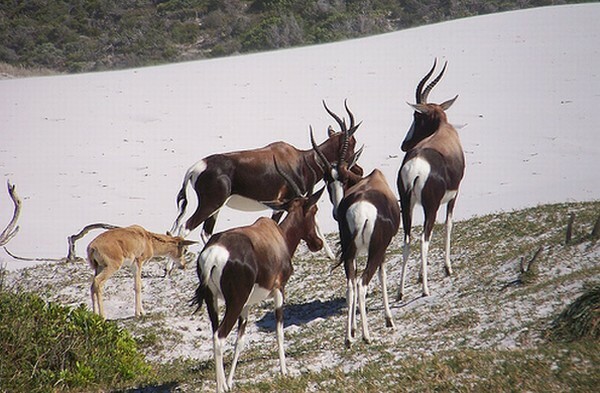 There are long circular hikes in the reserve or single direction hikes that require more planning and logistics. A popular 18km walk is from the Reserve gate to Cape Point and the reverse walk of 21km from Cape Point via Sirklesvlei to the Gate (21km). 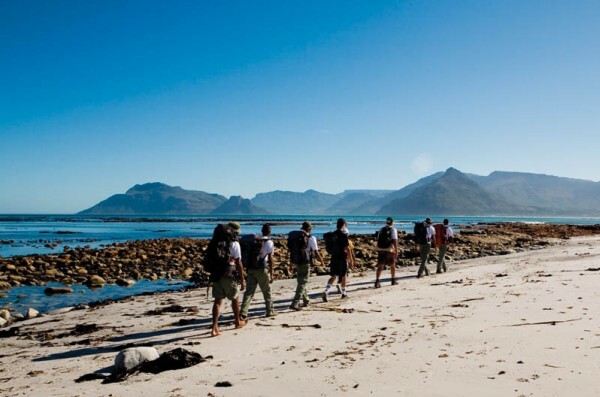 Mid range hiking include the 3 – 4 hour Gifkommetjie hike which goes via the Phyllisia shipwreck at Hoek van Bobejaan and back to Gifkommetjie. 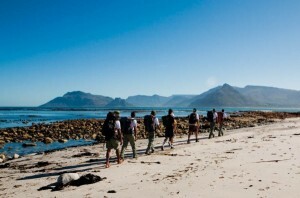 The 4 hour Platboom walk takes you along the beach to Gifkommetjie and back. 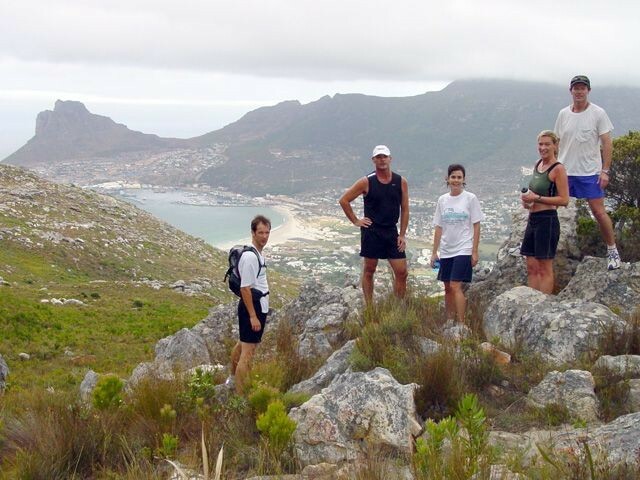 This includes hiking to Tranquility Cracks on the 12 Apostles (Camps Bay) side of the mountain which is a great spot to explore rock formations and a good spot to have lunch. 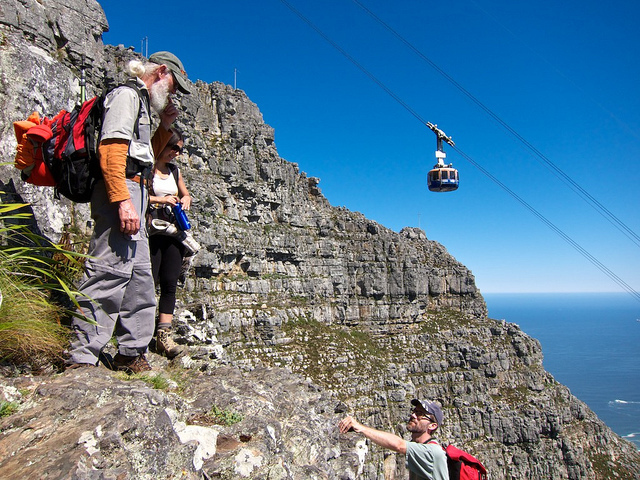 On this route you can stop where the Old Cableway used to be and then carry on hiking up through the Valley of Isolation (more beautiful rock formations) and up the backside of Table Mountain. From there you descend down the cableway. This hike is 7-8 hours of hiking. 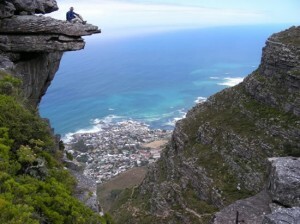 This is a hike on the front side of Table Mountain with beautiful views of the city below. I really enjoy this hike but it is only for those without a fear of heights as there are some parts with a bit of exposure. 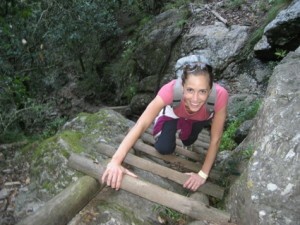 It is an adventurous hike with some rock scrambling (using your arms and legs to pull yourself up at times). 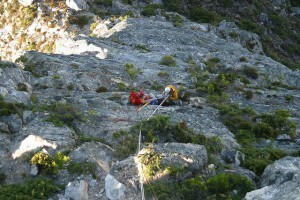 It is not a hard hike but it does have a few parts where someone who is afraid of heights may have a problem. It takes about 3-4 hours to get to the top and again you can descend down the Cable Car. 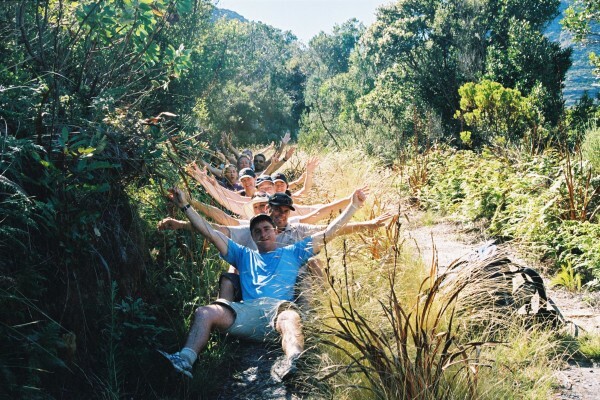 This hike starts in Kirstenbosch Botanical Gardens and ascends up Skeleton Gorge route through indigenous forest up to view the Hely-Hutchison dam up top and over to Maclears Beacon (the highest point on Table Mountain) and across to the Cable car where you take the easy descent. . This route could also be made into a circular route and you can head back to Kirstenbosch rather than go down the cableway. The hike either way is about 5 hours. IMPORTANT INFORMATION FOR HIKERS: Useful emergency contact details to take with you. Choose your route carefully and stick to it. Allow yourself enough time – start early. Inform someone of your route and what time you’re expected back. 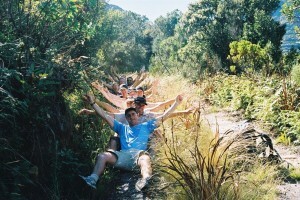 Choose a hike leader and walk at the pace of the slowest member. If lost – don’t split up. Rather try to retrace your steps. Remember that climbing down is more difficult than climbing up. Always take waterproof clothing, even in mid-summer, and wear walking shoes or hiking boots. Wear a hat or cap and sun block in summer. Weather changes rapidly. If lost or forced to stop because of bad weather, stay together and remain in one place. Find the closest shelter from wind and rain. In case of injury, take time to assess the situation. Then send two people for help and let the third remain with the injured person. If possible, mark the position on a map and send it with those going for help. Stick to well-used paths, which will be indicated on the Park’s hiking map and read the warnings on this map. Don’t take shortcuts and especially don’t wander into ravines. Always take enough water, especially in summer, and food in case of a delay. Watch the weather and time, and turn back before you start running late or if bad weather threatens. Take a fully-charged cellphone. Some parts of the Park do not have cell phone reception, but you will always be able to reach a place where you can use a cell phone more quickly than you’ll get to a landline. As Table Mountain is an urban park, please exercise the same common sense and security precautions that you would anywhere else in the world. Do not attract unwanted attention by openly displaying cash, cameras or other valuables. If you are confronted by a criminal, don’t resist. Handover your goods as resistance might incite a mugger to violence. Program emergency numbers in your cellphone before your hike. Like us or follow us for the latest summer activities, events and happenings in the south. This entry was posted in Activity and tagged Cape Town Hiking, Day hikes in Cape Town, guided hikes in Cape Town, Hiking. Bookmark the permalink.